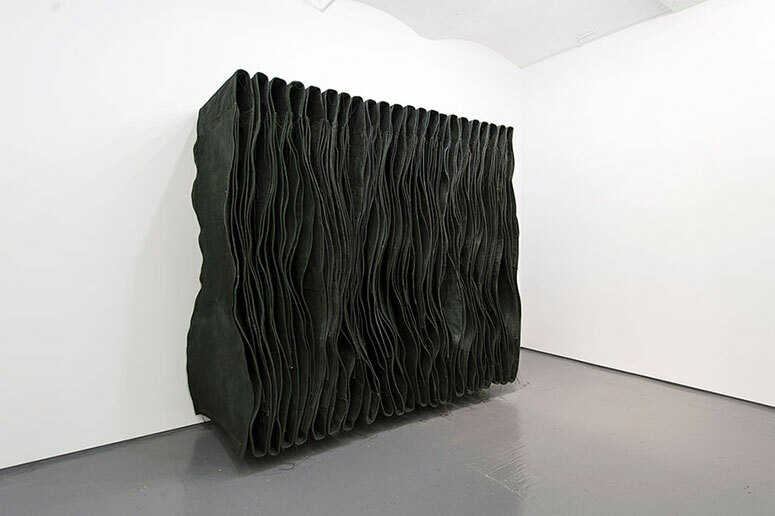 Treating canvas in a very different way and intentionally reversing the idea that material only serves as a means to create painting and narrative is the issue Simon Callery is concerned with. He discovers a unique aesthetic and formal language in arranging painting frames and canvas in unusual context identifying their sculptural and object related potential. FOLD Gallery is now presenting Callery’s latest body of work – Flat Paintings – which perfectly demonstrates the artists approach: all paintings are flat and rectangular – the two physical characteristics that define conventional image based painting. However, it is clear from the punctured surfaces and layered structures of these paintings that the artist is recasting the constituent elements of painting and developing convincing alternatives to established conventions. Another key element of the artists creative process is the importance attached to the landscape and surroundings of his studio. All works of his current show at FOLD Gallery originate in the landscape where Callery has worked for the last two seasons alongside excavations led by the Institute of Archaeology, University of Oxford in Moel y Gaer, Bodfari, North Wales. The influence of this landscape and excavation site on the painting translates directly into his oevre and suggests a closer look on all evidence of the making process to be traced and displayed as a significant feature of the completed work. Callery revives and highlights expressive physical qualities of contemporary art rather than repeating conventions of images and narrative. Defying common roads to painting and sculpture his conception of the object in its own formal qualities and environment is a key message being transmitted in three dimensional elements like multi-layered external and internal surfaces and voids as well as carefully chosen installation. The viewer literally becomes aware of the processes involved in looking at the artwork, the inner workings of a painting are here and present confronting the viewer in an intense and immediate way. You can peer inside the work and literally stick your haed inside some of the paintings. Callery masters the tricky task of translating a procedural event seamlessly into a highly aesthetic statement while making the process of creating art understood and valued for the viewer.